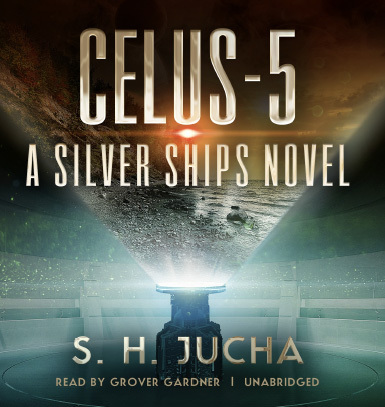 The audiobook for “Celus-5” will be released on June 1st and will be available through the book’s Amazon page link or you can search directly on Audible. For those outside the U.S., please allow a few days for your local Amazon pages to be updated. Grover Gardner delivers his usual accomplished narration style in this continuing story of Alex and company. This entry was posted in Readers, Uncategorized on June 1, 2017 by Scott Jucha. Looks like i will get to read Omnia before the celus-5 audiobook comes out. It is around 7PM on June 1st and the audiobook still is listed as pre-order, Amazon might have broken something. Remember, you have two different publishing processes at work here. I’m publishing the ebook directly with Amazon. However, Blackstone Audio is distributing my audiobooks through Audible, which must link up with the ebook’s Amazon page. It’s also come to my attention from readers and listeners overseas that often availability for them on non-US Amazon sites lags behind the US site by days. I figured that was the case that the audio file was still being processed through their system. Half way through Omni atm. Blackstone told me today, June 2nd, that they were running late, which means we’ll probably see Celus-5 audiobook on Audible over the weekend or on Monday. I hope you’re enjoying Omnia. Amazon is listing it as July 4 as the release date. I know Blackstone was running late a few days late. Why do I think someone in a hurry over there, mistakenly entered July instead of June! I’ve reached out to the Director of Publishing to sort this out. Thanks for keeping me informed. I must admit that once I hand off an ebook to Amazon or narration files to Blackstone, I don’t tend to follow up. Instead, I get neck deep into the next book. At this moment, “Empaths” is in its first draft with 68K words, and I’m enjoying the story!!! Does this might mean yo will likely have a series each for the remaining 2 colony groups or cluster their interactions like that in the silver ships series, since you brought up the Pyreans first book Empaths? Will Sol come back into the picture at any point? There has been enough time for things to have gotten better or worse there. A reduction in naval staffing if everything went in the better direction. A visit from a bunch of early retirees and the bored might make for an interesting visit. Besides, Alex owes a tale or two to someone on the space station if they come for a visit. Or you can make a visit from Sol again as an emergency request for help. Those are good questions and good points that you make about the passage of time at Sol. I’ve been wrestling with which worlds to incorporate into the future plot lines. At this time, I haven’t made up my mind. Right now, I’m deep into the first draft of “Empaths,” which means I’m not focused on much else. Appreciate the food for thought, K.
Scott , I loved the series. I read the whole this this week. There are many aspects of the series I absolutely love. Such as, the inter dynamics of SADE’s and humans. I often think about their core programming or birth. The silver ships seem to have formidable firepower but completely lack defensive armor or any real shielding. I’ve also thought about what Earth has been up to. I imagine the plant society and friendly forces relationship deteriorate, until a sphere enters their system. Uniting against a common enemy being the only thing they ever get right together, yet they forge ahead. I imagine bio luminescence on the new alien ships, Avatar – like neural connection’s with the ship systems. Incredibly difficult cultural exchange. I’ve got a science degree and I love how everything you’ve written is plausible. I consider myself a “pup” writer. I know your shifting gears into a new series, I left you my contact info today on your main page. I’d love to meet you and discuss the continuation of this series, I’d do it for nearly free. 🙂 not kidding. Thank you for your interest, Brian. I haven’t caught up on my contact emails from my website due to the extended July 4th holiday, but I will shortly. Once I read your contact email, I’ll respond directly. Thanks for reading!